Out second tournament for HALO: Reach will be Tuesday, October 26th. Pricing and start time will be posted later. This tournament will have a first prize consisting of HALO: 2600 and (tentatively) an ATARI 2600 to play it on. Posting this a little closer to the event than I would like, but we are having our first HALO: Reach tournament on October 12th, starting at 6PM. Tentatively, we are planning to have two or three tournaments a month on the LAN. The next HALO tournament will be in a few weeks, and have a first prize consisting of HALO 2600, and an Atari 2600 to play it on (tentatively. I have to verify that the 2600 works first). Interested in more tournaments? Besides playing in the tournament (and playing on the LAN and in the arcade outside of tournaments), please let Dan know what you are interested in. And if you want to volunteer to run a tournament or two, we’d be interested in hearing what you have in mind! On Friday, November 27th, 5-star any song in the ‘Out on the Road’ category or above on expert difficulty on our Guitar Hero Arcade game to receive a Guitar Hero action figure, while supplies last. In case I haven’t remembered to post it, btw, all songs are now 50 cents, no more extra quarter to play the premium songs! Updates to the blog coming this weekend, as we hope to be able to finish geting Point Blank 2 fully operational by then, among other things. Chronic procrastination and blogging are a BAD combination! Win a Data East Laser War pinball machine! Play games of Doctor Who at Docking Bay 93/Phoenix Nest on and between the tournament dates. If you make the scoreboard, ‘sign’ the game with the initials you registered for the tournament under. At the end of the tournament, the player with the highest score will be awarded the Laser War pinball machine (see below for further details on prize). No deathsaves, slapsaves, or excessive moving of the machine allowed. Absolutely no hitting or otherwise abusing the machine will be tolerated. No cheating of any kind. Failure to follow these rules can, at the sole discretion of the staff of Docking Bay 93 and/or Phoenix Nest result in you being issued a warning, asked to leave, removed from the tournament, or in extreme cases banning from the premises. While playing, please observe the rules posted in the entrance to the arcade, and practice good sportsmanship by not monopolising the machine if there are other players present and not interfering with other player’s games. Or to put it another way, play nice and have fun! Management of Docking Bay 93 and/or Phoenix Nest reserve the right to amend these rules if needed. If amended, the amended rules will be available at the front counter, and posted in the arcade. A promotional video for Doctor Who is on Youtube(or search for Doctor Who pinball), which explains gameplay in great detail. I also highly recommend reading the Pinball Archive rulesheet, which contains a detailed explanation of the game’s features as well as some very good strategy advice. If you have no internet access, I highly recommend having a friend print it out for you. 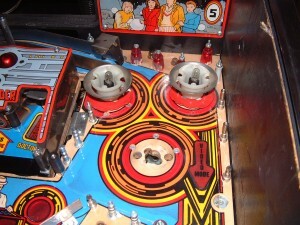 A basic scoring strategy I follow is to start with the first Doctor lit (change Doctors using the flipper buttons prior to launching the ball), and try to get into the video modes as fast as possible. Each video mode completed lights another Doctor, so completing a few video modes will greatly boost your score. For a quick score boost, always jump into the TARDIS at the end of the video mode wave. After the tournament, we can store the prize for a brief amount of time while you make arrangements. In the event you don’t want the prize, there are a few options. First, you could donate it to charity, either a charity thrift store or a youth group would probably be very grateful for the donation, and on top of doing a good deed, you’d get a reciept so you could deduct the donation on your taxes. Second, you could place the game on an auction site or place a classified ad and sell it. If you choose to do this, we will need to discuss storage and access issues at that time. And third, you could see if you have a friend who wants a pinball machine in his house. We do not recommend operating this machine for money without repairing the problem noted in the tournament announcement. 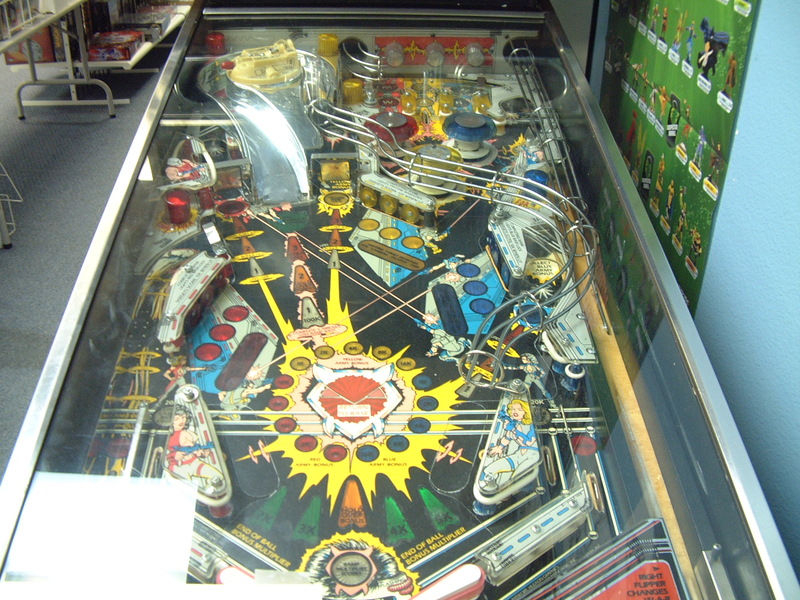 Today is the first day of the two-week long pinball toutnament at Docking Bay 93, being played on the newly-restored Doctor Who pinball machine. Scroll down a few posts for details, and we hope everyone has fun! The lack of posts yesterday was because it took longer to get Doctor Who working properly than anticipated. As of when it left for the shop (pictures of the leg bolt that delayed the pin being returned to the shop Thursday coming after I’ve had a good night’s sleep), the only thing wrong with it was a light in the lowest pop bumper is not installed. I had the wrong replacement parts for the broken socket. Not a bad tradeoff for a fully functional time expander, though. Addams Family has left the arcade briefly, for VERY much needed work. I won’t be giving any estimates for how long until it returns until I’ve had a chance to catalog what all needs fixed. I’ll keep you posted! Thanks for reading, and again, hope you have fun with the tournament! 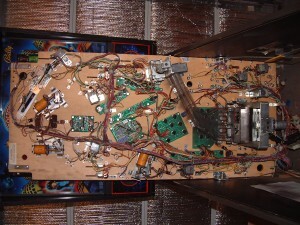 Work continues on the Doctor Who pinball machine. Most of the work is just basic cleaning, replacing of bulbs, and whatnot. The faulty circuit board has been replaced and no problems have been found. New bumper skirts are being installed, and a new light in the lower bumper (which was already removed when I took this picture). In other news, as you have no doubt noticed, we we removed Doctor Who for repairs, we replaced it with Tales of the Arabian Knights. The game will be filling in for the other pins as we rotate them out for repairs and maintenance. Currently, the skill shot is broken (we replaced the broken ramp with a good one, and we think a wire broke in the process), but that should be fixed within the next few days. With any luck, I should be back Tuesday night/Wednesday morning with pictures of a newly repaired Time Expander and a clean and bright game, ready for the upcoming tournament! I’ll also post links to the Doctor Who programmer’s blog, where he talks about designing the game, and to the Bally promotional video for Doctor Who on YouTube. It’s a little slow, but has a lot of great gameplay information. How do you win? Register your initials with Dan, then play the Doctor Who pinball machine any time during the tournament period. The high score on the game at close of business October 5th wins! The only entry fee is the 25 cents per game, and you may play as many times as you like! 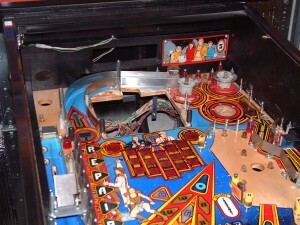 An information sheet will be provided on the starting date of the tournament with some basic gameplay information for the Doctor Who pinball machine, tournament rules, links to internet sites related to the game, rules that will be in effect in the event of mechanical failure of the Doctor Who pinball machine, and suggestions for what to do if you want to compete, but don’t have the space to own a pinball machine. About the Laser War machine: A fun, laser-tag inspired game from Data East. The specific machine is working (see note below), in average condition for a game of its age, due to damage to the spaceship toy and some wear, fading, and discolouration on the playfield and artwork. Game will be cleaned and checked for burned out lights prior to being awarded. The game currently has an electronic problem, causing it to occasionally reset during gameplay, which means it is not suitable to operate for money, but for most people will not affect their enjoyment at home. 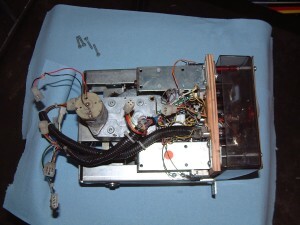 Included with the game will be the operator’s manual and an information sheet with a list of internet resources for parts and repair, should you wish to repair the game or have it professionally repaired, as well as basic maintenance information. In other news, unless anything else is found wrong with it (when I’m done, something on that pin will work that hasn’t worked since before we owned it, which I will post about tomorrow night! ), Doctor Who will be returning to the arcade Wednesday, at which time Addams Family will rotate out for some MUCH needed work. Then either Simpsons or Lord of the Rings, depending on which needs tlc more. I will be catching this blog up over the week (things have been a little hectic, with the amount of things around the house I need to do before fall weather sets in), and probably posting updates daily while I finish up Doctor Who and work on Addams Family. 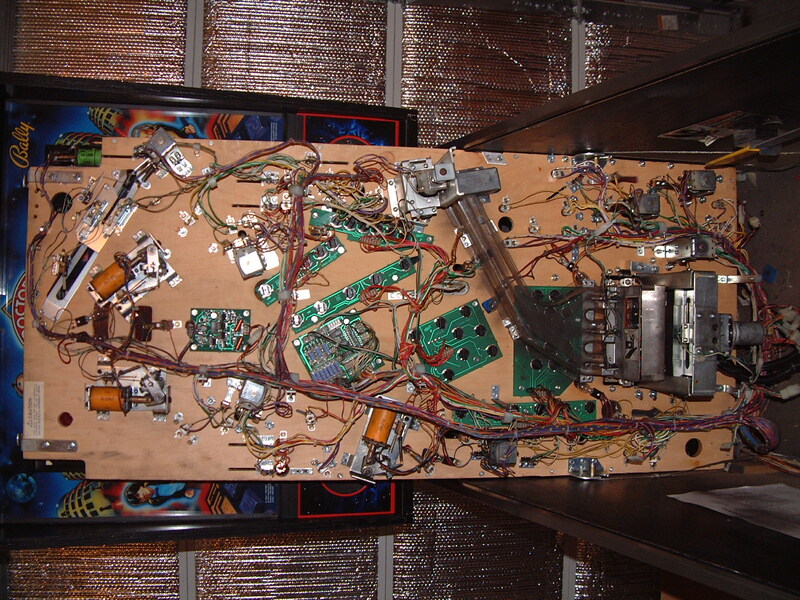 Anyone curious about what the inside of a pinball machine looks like, tune in tomorrow! (please note, links to the Internet Pinball Machine Database might not work intermittently for a few days, as their physical site was in the path of Hurricane Ike. Phoenix Nest Classic Video Arcade is happy to announce our second monthly pinball tournament, which will take place on the Spiderman pinball machine on July 18 – July 20. To enter, give Dan (the store owner) your name, phone number, and the initials you will be using, then go play. Tournament games will cost 50 cents, and you must start the game using the tournament button. First and second prizes will be determined by the machine based on number of tournament plays, minimum $10 for first place. The more tournament games are played, the bigger the prize! And coming in August, we will have a longer tournament, lasting two weeks, with first prize being a Laser Wars pinball machine! Details will be posted in a few weeks. In other news, one parts shipment still hasn’t arrived, so I can’t reveal everything, but expect a few changes in the arcade later this week, check back here for details as I can post them. Phoenix Nest Classic Video Arcade is proud to announce our first ever pinball tournament. For our first tournament we decided to keep it small, to work out any potential snags. If all goes well there will be a longer tournament later in June! The pinball machine will be SPIDERMAN. Players will need to register their name, initials, and phone number with Dan at the store prior to playing. There is no entry fee other than the cost of playing the games, which will be 50 cents in tournament mode. Tournament will run from opening of business Saturday (May 31) until close of business Sunday (June 1), with the player with the highest score taking top prize: a $10 gift certificate for Docking Bay 93 and a piece of pinball art, the backbox translite from Capcom’s last prototype pinball machine, Big Bang Bar. We plan to run at least one tournament/league every month in the arcade, and hope that you will play! You are currently browsing the archives for the tournaments category.